This gazetteer published by R. L. Polk lists all of the towns in Kansas in 1884-85 alphabetically, regardless of size. The information for each town includes the population, information about the town, and a list of business people in that community. The town listings begin on page 99. The classified business directory (see general index for page number) groups information by business, profession, industry, etc. for the entire state. The gazetteer also includes advertisements for many businesses, lists of state and county officials, district courts and judges. There is a general index on page 9 but it does not include the town listings. An index to advertisers begins on page 10. 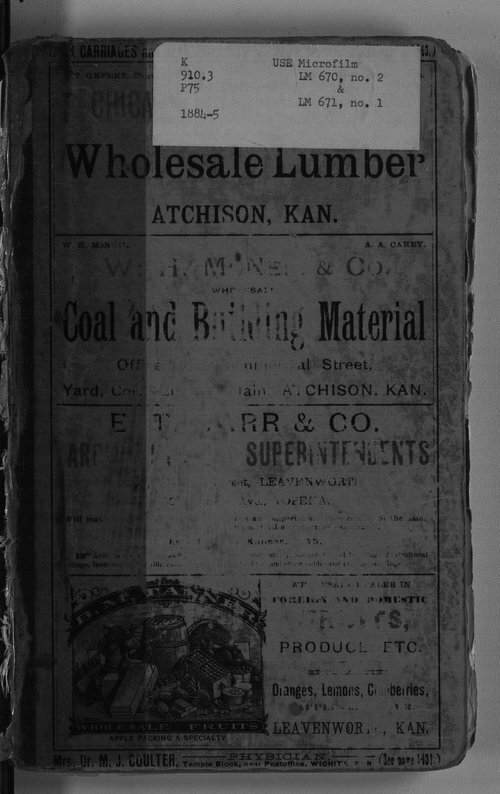 The gazetteer also contains a business directory for Kansas City, Missouri.